Here is the story of the enigmatic genius Nikola Tesla and his vast contribution to science and technology. Thoroughly researched, this volume presents important new materials: archival documents and photographs; excerpts from Tesla's writings, lectures, and diaries; selections from his correspondence (some previously unpublished). By placing Tesla's patents and inventions in historical context, the book documents how aspects of television, X-ray technology, wireless communications, and advance defense systems such as the U.S. Strategic Defense Initiative were foreshadowed in Tesla's work. The 250 black-and-white and duotone images create an invaluable record of the man and his times vividly showcasing his inventions and working methods. Learn more about the life and grand achievements of this eccentric wizard. History closed quietly over memory of Nikola Tesla when he died at the height of the Second World War. Somehow textbooks, encyclopedias, and museum archives managed to lose the proud genius who may have been the greatest inventor of any age, not only giving us the electrical basis of our modern civilization but correctly pointing science to the ionospheric circuit in the heavens. Since my first book about Tesla in 1981, interest in him has grown steadily and so has information about this extraordinary human being. That the memory of him survives is a tribute to the passions he inspired in a few scientists, engineers, and researchers who refused to let him be forgotten. His memory is also preserved today by a phalanx of lay admirers, not the least of whom are his fellow Yugoslavs at home and in the U.S. and Canada. In recent years the troops have ranged from ardent third-grade students in Michigan, to Ivy League scholars, U.S. senators, California rock stars, retired school-teachers, journalists, filmmakers, poets, and sculptors. This book provides a rare glimpse into Tesla's genius and the "wonder-world of electricity" he created. The reader will find two hundred and fifty historic photographs and illustrations, and important new research, including previously unpublished Letters and papers as well as interviews with leading contemporary authorities. This book, along with Robert Uth's documentary of the same name, Tesla: Master of Lightning, and Jim Glenn's The Complete Patents of Nikola Tesla (Barnes & Noble Books, 1994) also contribute to our growing knowledge of one of the world's most important inventors. Tesla is indisputably the father of alternating current power generation and transmission. His AC technology, first introduced on a large scale at Niagara Falls in 1896, remains unchanged and unchallenged to this day. The same holds true for Tesla's "Apparatus for Transmission of Electrical Energy," patented in 1900, which is still the basis for transmitting and receiving all radio and television signals. These two technologies alone merit the recognition and gratitude of every inhabitant on this planet. Like other great inventors, Tesla was a true Renaissance man. He turned fresh loam across half-a-dozen fields of science. He patented hundreds of inventions, crafted his own tools, built his own machines, practiced and consulted as an electrical engineer, handled his own press relations with dexterity and am, and was even known to write poetry. Not only did this 19th-century polymath perform such heavy roles under one hat, he was also an environmentalist, a health and nutrition advocate, a philosopher, and many would say a visionary genius. Tesla was a "heroic" inventor--something we need more of today. He looked at invention as a way to improve the lot of mankind, not just a means of enhancing wealth, or meeting the demands of the marketplace. He never married, though he was a convivial socialite. With respect to his work, he was a loner. He once confided to a relative that he did not wish to be swayed by corporate generosity and, in truth, there was little danger. His indifference to corporate and academic alliances, not to mention a certain testiness toward fellow engineers, plus the fact that he had no offspring to carry on his name, lay at the root of the obscurity which befell him. Well aware of the irony of his position, Tesla wrote sulkily to the New York World in 1919, "No amount of praise is too much to bestow upon Edison for his vigorous pioneer work, but . . . had the Edison companies not finally adopted my invention they would have been wiped out of existence, and yet not the slightest acknowledgment of my labors has ever been made by any of them." Though few inventors have contributed more to the development of the United States as a world power, the prestigious Smithsonian Institution has never substantially acknowledged Tesla's contribution. His alternating current generator, for example, is included in the museum's exhibit on Thomas Edison. The Institution has also been reluctant to credit Tesla's critical role in the invention of radio even though the U.S. Supreme Court affirmed his patent priority over Marconi in 1943. In the Smithsonian's defense, attempts have been made to produce a special Tesla exhibition in cooperation with the Nikola Tesla Museum in Belgrade. However, a decade of fighting in that region has prevented the project from coming into fruition. As a result of this historical bias, Tesla's major inventions are usually attributed to others. And since reference books are revised only periodically, they too remain generally inadequate on the scope of Tesla's contributions to our modern electronic culture. Following Tesla's death, another set of peculiar circumstances added to his obscurity. Virtually forgotten in the United States, his remaining possessions were shipped to his native Yugoslavia and placed in the Tesla Museum in Belgrade. With the onset of the Cold War, Western researchers interested in his work encountered the frustrating obstacle of geography and the political barrier of the Iron Curtain. Because of revolutionary ideas he advanced for electronic weapons, many of Tesla's technical papers in the United States disappeared or became cloaked in top-secrecy. In the end, it was Tesla's incredible vision that inspired the U.S. Strategic Defense Initiative or "Star Wars" program. But Tesla's inventions are not science fiction fantasy. Every time we turn on a light, or a radio, or operate a remote control we continue his legacy. His name should be respected everywhere electricity flows. Nikola Tesla (1856–1943), a Serbian immigrant to the US, made his mark during the period when electrical invention beckoned engineers and scientists like a siren. Tesla’s contributions to the electrical world include the practical distribution of electrical power, the induction motor, the development of radio, and others. Yet for all his contributions, Tesla remains practically unknown, although engineers and scientists routinely use his name for the unit of magnetic flux density. 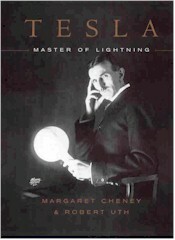 Prior to this book, Margaret Cheney wrote an extensive biography of Tesla, Tesla: Man Out of Time, and Robert Uth had documented Tesla’s life in a film with the same name as this joint work with Cheney. Both writers know their subject and portray Tesla with an enthusiasm that includes an examination of his successes and his faults. This short large-format book, complete with many illustrations and photographs, chronicles the highlights of Tesla’s remarkable, yet somewhat tragic life. This book tells how Tesla’s life included brief employment by Thomas Edison that quickly dissolved into mutual enmity. Edison, well known for his many inventions, pursued the path of distributing direct-current power, while Tesla proposed alternating-current distribution. Practice proved Tesla’s method correct, yet Edison slipped into history as the driving force behind power distribution. Although Tesla should get credit for making electrical power practical, when people think of electricity, Edison’s name usually comes to mind first. Although Tesla was accorded great prestige at times, fortune from his many inventions eluded him his entire life. Tesla worked with George Westinghouse to develop massive power-generation projects that distributed AC power far and wide in the 1880s using Tesla’s inventions. When Westinghouse complained about excessive royalty payments to the inventor, Tesla simply canceled them instead of renegotiating them. Often Tesla would demonstrate all sorts of electrical phenomena, but turning them into practical inventions proved difficult. Many of his ideas went unpatented because he had no money to file patents or to push applications through the patent system. Without his own money to fund developments, Tesla frequently turned to colleagues and friends for investments that often yielded little—for the investor or for Tesla. Although Heinrich Hertz first showed the transmission an electrical signal through the air, it was Tesla who first demonstrated the combined fundamental components of a “radio” as we now know it. And Tesla patented his technology several months before Marconi, the man who today many consider the inventor of radio. Thus it was with Tesla, always ahead with ideas but late to realize a payoff or glory. Only after Tesla’s death—and after his patents has expired—did the courts recognize him as radio’s inventor. This book provides many other absorbing stories of Tesla’s developments and inventions and personal milestones. It’s an engaging look at Tesla, including his faults and failed enterprises. Although this book is not a scholarly work, it’s full of interesting information. The authors provide a thorough bibliography for anyone who wants to read more. I wish they had recommended a few books, rather than simply listing their sources. The book is heavily illustrated with interesting photographs of people and equipment. If you’re interested in the history of electricity, this book is worth its price several times over.